Welcome or Bienvenido our 5th and final day of Around the World with Joe DiStefano! We’d love to hear from our readers- did you enjoy the series? Did you try any of Joe’s recommendations? Email us at hello@lexody.com to let us know! Pozole, the Mexican pork and hominy soup is a renowned hangover cure. Like many of the best such remedies—Korea’s samgyetang and seolleongtang come to mind—it’s a season it yourself situation. Served with diced onion, cilantro, and lime as well as shakers of oregano and red pepper it’s a nice pick-me-up. I like the pork and corn concoction well enough, but no matter how much seasoning I add it never has the incendiary heat I so often crave. That’s why I’m glad I happened upon pozole rojo at Taqueria Coatzingo. As the name implies, the broth is red—very, very red—thanks to loads of chilies. 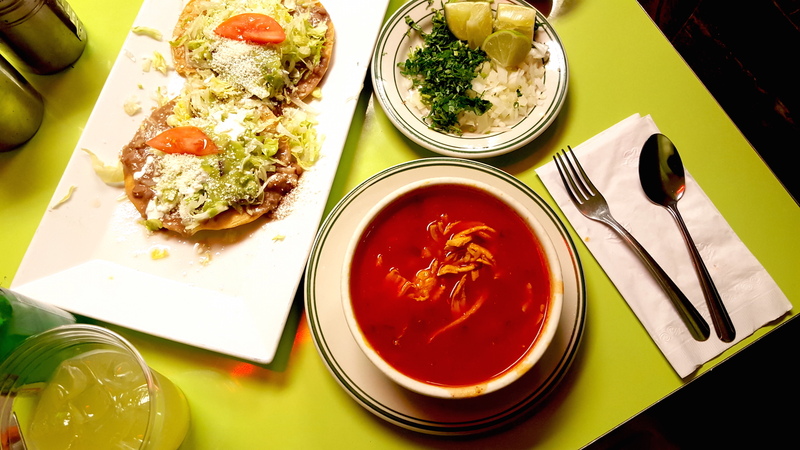 Unlike its tamer cousin, pozole rojo’s employs chicken rather than pork as a base. It comes with the standard seasonings and pair of tostadas that are part of every complete pozole experience. The addition of a few squeezes of lime along with a handful of onion and the other seasonings make for one of the most head-clearing soups I’ve ever slurped on Roosevelt Avenue. Sour, spicy, and packed with fresh herbs, hominy, and chicken it’s sure to cure what ails you. And hey, if it’s not spicy enough you can always add a few shakes of red pepper.